Thermal energy content of the climate system has decreased in this 6 years long period at a 0.19 × 1022 J/year rate. It corresponds to a -118 mW m-2 radiative imbalance at TOA. The fit is awful because of the huge step-like change of OHC in early 2003 and also the high noise level before. I guess these features are measurement errors due to changing coverage & instrumentation. I could not collect proper data files, so re-digitized both NODC OHC & CERES FLASHFlux (pp. 21) graphs. You can find the csv here. The dimension is 1022 J for both columns, offsets arbitrary, slope of TOA radiation imbalance as well (being the temporal integral of a function with offset unknown). Time resolution is three months. 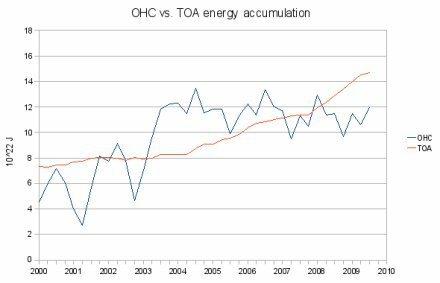 Net TOA flux should be very close to proportional to the time derivative of OHC, because there is no other heat reservoir in the climate system with comparable storage capacity. Rapid large scale (back & forth) heat exchange between the upper 700 m of oceans and the abyss has no know mechanism, turnover time being several millenia. If climate system heat content is calculated from net TOA fluxes, only the second derivative is measured by CERES with reasonable accuracy, therefore heat content history has a free additive linear term. With OHC, on the other hand, the temporal inegral itself is measured. What I did was to choose the free term for best fit. It can be done for the last six years, but not before first half of 2003. This is the same period when ARGO float deployment was still at an early stage with poor global coverage and rather few floats compared to the target of 3000. At the same time older systems were already phased out almost completely. The systematic error is large and unknown. Net flux at TOA is estimated to be 2 ± 5 W m-2, i.e. even the sign is doubtful. In this sense TOA flux is not measured at all by CERES. However, interannual variation is much better constrained. The large difference between figures in #60 & #62 comes from OHC. The transition around 2003 from MBT/XBT stuff to ARGO has a huge intercalibration problem. That is how the “missing heat” was produced. If the unknown offset of CERES FLASHFlux is aligned to the early 21th century OHC data, one gets a positive slope but poor fit with much missing thermal energy by the end of this decade. On the other hand, if it is done the other way around and FLASHFlux is aligned to the late part of OHC, the fit is excellent except before mid 2003. In this case we do not have any recent “missing heat”, but excess heat before 2003. My guess is the thermal energy was there, in the upper 700 m of oceans, just was not measured properly (e.g. in southern Pacific). In this case one does not have to invent mysterious processes transferring heat into the abyss directly through a 700 m deep cooling layer. What is more, this process would only carry heat, but not dissolved carbon dioxide. After all CO2 deep mixing is supposed to be extremely slow. So far so good. However, we still have a problem. Not with measurement, but with theory. OHC and net TOA flux measurements can be made consistent, but at a price. We have a negative energy balance for the last six years. The climate system is not gaining energy, but losing it. A -118 mW m-2 rate may not sound much, but is enough to bring havoc to standard greenhouse theory. It is about the decrease in TSI (Total Solar Irradiance) due to weak and late cycle 24. But wait, CO2 has increased from 375 ppmv to 389 ppmv between 2003 & 2010. The change in radiative forcing during this period is about 5% of a CO2 doubling. Effective temperature of Earth as seen from space should have decreased by 0.15 °C if climate sensitivity is 3 °C for carbon dioxide doubling as claimed. It is equivalent to a positive energy imbalance of 560 mW m-2 at TOA, which is not seen. The only rebuttal offered on John’s site was by Chris, who says that the sea level rise as measured by the TOPEX/JASON satellites proves energy is still accumulating in the oceans. And that error term is probably on the very generous side, it should probably be a good deal bigger. There was also an editorial comment from John Cook about Von Shukman’s analysis of ARGO to 2000m and the possibility of Trenberth’s missing heat hiding in Davy Jones locker. I have my doubts, and I’ll explain why in a further post. I think Peter may be wrong though, abut the fluctuation of the ARGO being due to measurement noise, I think following up my previous post and subtracting out ENSO using the SOI will quieten that data down considerably. Watch this space. That is correct. To compare it with other variables, if possible, to the real causes. Adolfo, yes. My preliminary post introduced SOI into the euation. I also have an interesting new TSI-OLR-SOI index I’ve created. More soon. It is a curious thing, the more the CAGW crowd tries to state that the hidden heat is in the oceans and it just takes an ever longer time to manifest, the more they diminish the role of CO2 and LWR relative to SWR. If the energy within the oceans residence time is very long, then any change in the energy most capable of heating the oceans, SWR, will have a far greater effect then the short term energy of LWR within the atmosphere. Tallbloke states, “The only rebuttal offered on John’s site was by Chris, who says that the sea level rise as measured by the TOPEX/JASON satellites proves energy is still accumulating in the oceans. Thank you for that. I have long been curious of how accurate these measurements are. We have had a three decade argument on the land level in southern calif, (google Palmdale bulge) Meausreing the land level must be easier then the ocean. 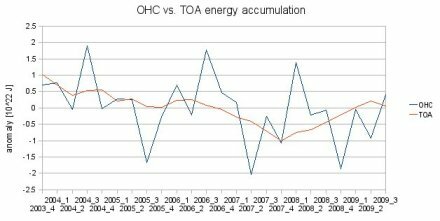 Good post and I’m in agreement with Berényi that there is much error in measuring OHC and this accounts a good proportion of the ‘energy gap’. I think the rest of the lost energy comes from work being done by the Earth’s heat engine (hydrological cycle) and the transform of thermal energy into other forms by chemical and physical processes. As in all things climate, we try to gain understanding by breaking down each bit of the whole into more manageable chunks, but in the process fail to recognise the influence of each chunk when interacting with the others dynamically – usually with some lossy energy transfer. Only an integrated approach, based on observation, will allow us to see what is really happening. A geophysicist has made the first-ever measurement of the strength of the magnetic field 1,800 miles underground – inside Earth’s core. The magnetic field strength is 25 Gauss, they say, 50 times stronger than the magnetic field at the surface that makes compass needles align north-south, the middle range of what geophysicists predicted, but it puts constraints on the identity of the heat sources in the core that keep the internal dynamo running to maintain this magnetic field. A strong magnetic field inside the outer core means there is a lot of convection and thus a lot of heat being produced, for which scientists would need to account. The presumed sources of energy are the residual heat from 4 billion years ago when the planet was hot and molten, release of gravitational energy as heavy elements sink to the bottom of the liquid core, and radioactive decay of long-lived elements such as potassium, uranium and thorium. 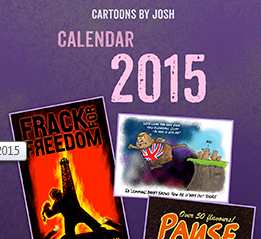 Not sure about that PG. Supernovae are pretty effective at jamming stuff together to make heavier elements, or so I’ve been told. One can see a possible intercalibration problem between the TOPEX/Jason systems. The long term (century scale) secular sea level change, which is fairly linear, is probably due to volume changes of ocean basins because of postglacial isostatic rebound and has nothing to do with OHC. I am fairly confident average IR optical depth of the atmosphere is kept in a narrow range by water vapor in spite of increasing absorption in the CO2 band. It can happen even with increasing average humidity, because the distribution of water vapor is fractal-like over many orders of magnitude (from meters to a thousand kilometer). Therefore there are see-through “holes” in the distribution. It is not enough to measure averages, one also needs higher moments (which are not measured properly, as far as I know). I think analytic computational models are hopeless for complex systems. The key is to figure out how entropy production works in the climate system and how the Maximum Entropy Production Principle should be applied. I am surprised this approach is mostly neglected by mainstream climate science. I also think there is a huge UHI (Urban Heat Island) effect in surface temperature trends as average population density has doubled almost twice in a century. On the other hand, soot deposits of industrial and/or agricultural origin on snow has a much larger effect at high NH latitudes than it is generally supposed. As soot is washed out from the atmosphere completely in several weeks, substituting biofuel (like dung) with proper cooking fuel all over the world, filtering industrial smoke even in China and restricting small diesel engines while filtering exhaust from large ones would have an immediate beneficial effect. It is also much cheaper than outphasing carbon based geofuels in a rush. Peter’s point about maximum entropy production is important. This is how Willis Eschenbach is thinking too with his post on WUWT concerning the constructal law. The Earth will work as hard as it can to dissipate the incoming heat. The changes in ocean currents, jet stream latitudinal positions etc govern this. If we can find data which link changes in those to the solar cycle and solar wind, and geomagnetism, we are getting there. OLR & ASR are measured at TOA with some spatio-temporal, angular & frequency resolution, with some accuracy & precision as well, so at least a raw entropy production map could be drawn. It would be both easy and interesting. Unfortunately I don’t have the data. Still, I don’t quite see why the guys responsible for it do not give a try to this track. With a simple 1D radiative balance model using “grey” atmosphere & surface it is easy to show there is an intermediate value of atmospheric IR optical depth for which entropy production is at its maximum (this is a “no convection” case). That is, if MEP is supposed to work and the system is capable to adjust IR optical depth (via water vapor), there is a strong negative feedback in this model. I do not yet see clearly how (cloud, ice & snow) albedo changes fit into this picture, however. Anyway, the climate system has plenty of degrees of freedom, so it must be in a state of self organized criticality. It means it generates scale invariant internal (pink) noise like crazy, that is, unforced fluctuations occur on all scales. There’s some excellent intelligent stuff here. I am particularly taken by Péter Berényi’s suggestion that the fractal nature of water distribution means that it might behave differently from that implied by its simple average distribution – thus once again demonstrating, as with the world annual temperature averaging farrago, that physical reality is rarely approximated by simple averages. Just as Roy Spencer and many others have pointed out, only a tiny percentage change in cloud cover is needed to account for the whole of the reported net rise in ‘average’ world temperature over the last 150 years, so we might have a similar (and synergistic?) mechanism here. In simple-minded terms, if the water ‘bunches up’ in places leaving corresponding holes between the bunches (but keeping the overall arithmetic average the same) then the increase in absorption of radiant energy in the bunched-up bits might be less than the decrease in absorption due to the holes. This would represent a very nice thermostatic negative feedback mechanism based on the sound non-linear physics of absorption as a column of GHG gets deeper and/or denser. In the search for Earth’s thermostat, this may turn out to be an extremely important conceptual breakthrough. When a star nova / supernovas it does not explode it erupts. Energy that has built up in the star is released, ether slowly or quickly. When you pop the cork on a champagne bottle the bottle does not explode. There is no increase in pressure in the bottle, just pressure release. During a nova event gravity pressure “in” is no longer greater then the energy pressure “out” and the matter of the star erupts, it does not explode. When an astro-body grows large enough, its’ gravity will trap enough hydrogen to become “lite”and at some point a visible star. The hydrogen can be gathered “locally” or made on “site”. Once a star becomes “lite” it tends to blow the local hydrogen away, so gathering a large amount at one time before becoming a lite star makes for a larger star. Small stars give off as much matter and energy as they create and are fairly stable, While very large stars gravity trap matter and energy until energy pressure out, erupts, novas. Very large stars have a very large and dense neutron core. If parts of the neutron core are ejected during a nova event they will fission into heavy elements. I was curious if you have tried to fit any of these cycles into the seasonal changes as I mentioned in this post to Willis, and if you thought this could further educate us on energy flows. Have you considered, that collapse of thermosphere has made changes to the whole atmosphere? Radiation works as a soundwave, the longer wave the easier it penetrates all barriers. So if atmosphere shrink’s down longwave IR goes easier through. At the same time density change in atmosphere makes differences to lower atmosphere, like turnig jetstreams. And all this, because radiation spectra from the sun is diffrent and lack of solar wind? In this case, missing energy goes to heating atmosphere, because IR throws out more than Sun bring’s in. Simple. Yes, it does seem that more energy seems to be going out than coming in recently. The shrinking thermosphere could be an important factor, and your explanation makes sense to me. Thanks. Reminds me of the recent observation of ‘popcorn'(?) clouds over the ocean, clouds and holes alternating — clouds fade, holes fill in, repeat. Something dynamic with energy flux is going on there. Hi Tallbloke and any who care to help me with this. Some of this is similar to another post but has new thoughts added and what, to me at least, are original questions which are I think valid. I get excited when I have new thoughts, so forgive the caps later in the post. In likelihood this is probably old hat, but I appreciate your thoughts on my questions at the end. Your answers will certainly be new to me. Have you looked at the bi-annual cycles in all that we are measuring to see if the earth’s seasonal energy pulse can reveal some of this missing energy mystery? Sunlight, falling on the Earth when it’s about 3,000,000 miles closer to the sun in January, is about 7% more intense than in July. Because the Northern Hemisphere has more land which heats easier then water, most people state that the Earth’s average temperature is about 4 degrees F higher in July than January, when in fact they should be stating that the ATMOSPHERE is 4 degrees higher in July. In January this extra SW energy is being pumped into the oceans where the “residence time” within the Earth’s ocean land and atmosphere is the longest. There are also other factors, such as the Northern hemispheres winter increase in albedo exceeds the southern hemisphere’s winter albedo due to the far larger northern hemisphere land mass. So at perihelion we have a permanent loss to space of ? W/2m SWR due to increased Nothern hemisphere albedo and a loss of SWR to the atmosphere, as at perihelion the SWR is falling on far more ocean, where it is absorbed into the oceans for far longer then if that SWR fell on land. Do these balance (unlikely) or is the earth gaining or losing energy during perihelion??? The TOA flux should tell us, and climate models should accurately predict the observation. As we KNOW the TOA SWR TSI flux between perihelion and aphelion, this should be a metric to see if we are really missing the energy or not. Now our satellite analysis claim we have missing energy. IE, more energy is coming in annually then going out. This should certainly be true in the winter, as the oceans are absorbing more, but is it true in the summer??? As these immense changes in SWR TSI happen bi-annually, then how much and how rapidly changes in most things we measure in climate, temperature, cloud cover, albedo, SST, OHC, TOA flux incoming and outgoing must be reflected in these bi-annual changes and analyzing these relative to the bi-annual 7% perihelion/aphelion flux in SWR should give deeper insight relative to heat and energy flux within our earth system. More significant to CAGW theory; should AND DO THE CLIMATE MODELS ACCURATELY CAPTURE AND PREDICT THE SEASONAL FLUX IN TEMPERATURE, CLOUD COVER, SST, OHC, TOA INCOMING AND OUTGOING, ETC, CAUSED BY THE EARTHS SEASONAL PERIHELION AND APHELION ??? AND CAN THEY PREDICT WHAT WOULD HAPPEN IF THIS WAS REVERSED AND THE SUN WAS AT PERHELION IN JULY DURING THE NORTHERN HEMISPHERE SUMMER??? AND DO THESE CLIMATE MODEL PROJECTIONS MATCH THE HISTORIC PROXY RECORDS FROM ABOUT 12,OOO YEARS AGO WHEN LUNISOL PRECESSION THEORY SAYS THIS WAS THE CASE???? Ok, calmed down a little, but does it not seem logical that a climate model that portends to predict the climate from a moderate change in greenhouse gases, should therefore be able to accurately predict the results from far more immense W/2m changes that happen every year and reverse hemispheres every 12,000 or so years??? Don’t have time for a long reply which your comment deserves, but watch out for some data being ‘seasonally adjusted’ to account for the SW annual variation and some not. I don’t know if the more sophisticated GCM’s include it or not, but it is an important factor. Try asking on WUWT or realclimate, someone will know. The air circulation systems moved poleward during the late 20th century warming period under the influences of an active sun and warm PDO. I first noted that process going into reverse around 2000 but for a while the energy budget effect would have remained positive. However the reversal has continued to date with much more meridional/equatorward jetstreams now being more widely recognised. I would guess that due to the associated albedo changes the whole system finally went negative around 2003 which would accord nicely with the observations described above. To date we have been on the plateau at the top of a natural warming curve and should now start to develop a clearer downward trend unless solar cycle 25 picks up significantly after a quiet cycle 24. Seeing as the Earths surface varies considerably in height, how can you determine sea level from a satellite to within mm? The ocean height is also varying all the time with air pressure, temperature, weather, Lunar attraction, etc. The radio path length through the atmosphere is no exception, varying with weather conditions.